Stethoscope: what is it and how is it used? The whole point of making this website. The mighty stethoscope. A stethoscope is a medical device that is used, generally, by doctors, nurses and other medical professionals. They use it predominantly to perform checks on the heart and lung functions. These checks are called auscultations. Thanks to a stethoscope medical professionals can easily hear if your heart or lungs function properly. To a lesser degree mechanics also use stethoscopes. During the running of an engine stethoscopes can be used to determine any faults that might happen in the cylinder of a combustion engine. Unfortunately you cannot open a cylinder during a running engine to check out faults as this would intervene with the normal functioning of an engine. Therefore a stethoscope allows them to perform diagnostics on the engine. Much like a medical professional with a human body. It was invented in France by the french scientist Rene Laennec in Paris. This innovation came from necessity. He felt uncomfortable placing his ears on women’s chests in order to listen to heart sounds. As a result he decided to come up with a device that would add a little bit more distance between him and his patients. The first prototype he came up with looked like an ocular device pirates would use. He would place his ear on one end of this primitive stethoscope and the other end would end up on his patients’ chests. The design for this device has a lot of similarities with an old hearing aid device called an “ear trumpet“. Rene noticed that a rolled up notebook would amplify the sound of a beating heart without physical contact with the patient. He called his device a stethoscope. The term stethoscope has its origins in Ancient Greek. “Stethos” means chest and “Scope” which can be loosely translated as a listening device. The earliest forms of stethoscopes that resembles the ones we know today came out in 1855 and were invented by Golding Bird. These were the first ones to feature flexible tubing. This next level of innovation was meant to provide extra comfort to the people performing auscultations. Stethoscopes as we know them today are arguably the most recognizable piece of medical equipment out there. They are THE sign of medical professionals. Studies have also shown that images of people in lab-coats get a huge bump in confidentiality if they have a stethoscope draped around their neck. 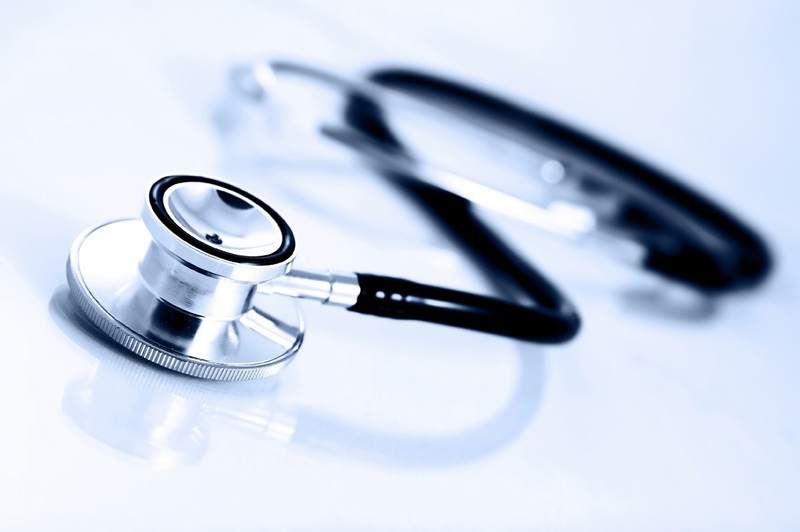 automatically people associate stethoscopes with the trustworthiness of a doctor. Even though mechanics, albeit to a lesser degree, are frequent users of stethoscopes as well! There are those that say that slowly but surely the stethoscope is becoming obsolete. The rise of portable ultrasound devices are slowly fazing out the stethoscopes in hospitals. At least when it comes to cardiovascular research. In checking lungs and bowels for signs of disease however the stethoscope still has its place. However only time will tell for how long. Probably the best known stethoscope-type. They operate on the transmission of sound from the chest piece to the listeners’ ears, via air-filled hollow tubes. The chest piece usually consists of 2 sides that can be placed on the patients’ chest. a bell and a diaphragm. If the diaphragm is placed on the patients’ chest, acoustic airwaves are produced by the vibration of the plastic diaphragm which travel through the tubing to the listeners’ ears. If the bell is used then the vibrations are directly transmitted to the listeners’ ears. the diaphragm is used to hear high- frequency sounds while the bell best delivers low frequency sounds. Both are necessary to conduct a full scale auscultation. This two-sided stethoscope was invented by Rappaport and Sprague in the early part of the 20th century. Both also have stethoscope types named after them. One major issue with acoustic stethoscopes has always been that the sound level is really low. This problem was overcome however in 1999 with the invention of the stratified continuous lumen, and the kinetic acoustic mechanism in 2002. The first way in which this is done is by placing a microphone in the chestpiece. However this method has a lot of drawbacks. By amplifying the sound directly you have to deal with a lot of background noise that will be inadvertently amplified as well. This can seriously hinder an auscultation. Another way to do this, and how 3M for instance does it, is to use a piezo-electric crystal. Piezo electric crystals work in such a way that when pressure is applied to them (think a heartbeat), a small electric charge is released. As a result ambient noise is filtered out and you only hear the actual heartbeat in digital form. The big benefit of electronic stethoscopes is that you can store a patient’s auscultation to form a base-file of that patient. You will always have a future reference to go to if you hear or find something out of place. Secondly as the sounds they produce are digital, you can add a splitter device to the acoustic-outlet. This enables you to add a second pair of headphones. As a result you and your students can listen in on the same auscultation and you can show your students what to look out for. A fetal stethoscope or a fetoscope looks a lot like the old listening trumpet. The device works by placing one end of the stethoscope on the pregnant woman’s abdomen. This allows the listener to listen to the heartbeat of the fetus. A fetoscope is also called a Pinard horn after the French obstetrician Adolphe Pinard. A doppler stethoscope works using the famed doppler-effect. Motion is detected by the change in frequency of the soundwaves. As a result stethoscopes that use the doppler effect as the main detection principle have been shown to be more sensitive in the detection of aortic regurgitations and the detection of impaired ventricular relaxation. Wherever possible it is recommended to do an auscultation in a quiet space. For EMT’s however this is not always possible and for them different stethoscopes have been developed. You can read more on the best stethoscopes for EMT’s here. Mostly the stethoscopes they use have special noise-dampening technology to muffle out the background noise. The reason why you need to do an auscultation in a quiet space seems self-evident. It is important you focus fully on the sounds you want and need to hear. A noisy environment will only distract you too much from the job at hand. Next it is important to keep in mind that the positioning of the patient plays an important role during the auscultation. A patient’s lungs can sound different whether he or she is laying on his/her’s side or sitting up etc. To listen to the heart and abdomen it’s recommended for your patient to lay down. However for the lungs you’ll find it easier if the patient is sitting up. Thirdly you need to decide if you want to go for the high-pitched or low-frequency sounds. The chestpiece on your stethoscope most likely will have 2 sides. One’s a bell and the other one is a diaphragm as described in the sections above. The diaphragm is the bottom side pictured in the image above. It basically is a plastic sheet that transmits vibrations from your skin and delivers them via the tubing to the listener’s ears. It is this side you have to use to hear medium to high-pitched sounds. On the other hand the bell-side is just a chamber that forms between the chestpiece and your patient’s chest. The change in volume of this chamber as a result of for example heart beats causes sound waves to travel via the tubing to the listener’s ear. Use this side for the..you guessed it.. low-pitched sounds. Note: Always use the chestpiece on bare skin. If your patient still has clothes on while you use your stethoscope chances are you’ll hear nothing but rustling. The same issue persists if you treat someone who is overly hairy. Unfortunately in that case there is nothing the patient can do about it other than shave everything off. However if you face a particularly hairy patient, keep the chestpiece still to keep the rustling to a minimum. Heart sounds are generally medium to high-pitched. So in order to study the heart you need to use the diaphragm on your stethoscope. Place the diaphragm on your patient’s chest. Try to place it in such a way that the diaphragm covers the space on the left upper chest, where the 4th and 6th rib meet. This is almost directly under the breast. Then hold the chestpiece between your index and middle finger. Gently apply pressure until you do not hear your fingers rubbing together anymore. Ask your patient to breathe normally. Try to listen to the heart for a full minute. During this time you should hear a sound which is best described as a “lub-dub”-sound. Of course it is hard to convey a sound through written text but I have found that “lub-dub” comes pretty close to what you will hear in real life. These “lub” and “dub”-sounds also have their own, more scientific names. The “lub”- or systolic-sound happens when the mitral and tricuspid valves of the heart close. The “dub”-sound, or diastolic, happens when the aortic and pulmonic valves close. Usually a normal person’s resting heart rate can be anything between 60 and 100 beats per minute. A well-trained athlete however will have a bigger heart. As a result the heart will need to pump less per minute to circulate blood around the body. A well-trained athlete’s resting heart-rate lies between 40-60 beats per minute. For infants and kids under 10 years old the normal heart-beat per minute range varies per age. For newborns it is very fast. Between 70-190 BPM. However then as the kid matures, their heart grows and has to beat less to keep the blood flowing. Once a child turns 2 their heart beats already between 80-130 BPM. Children between 7-9 have a heartbeat between 70-110 BPM. First up if the heart-rate is elevated from the normal, that might be a sign of an underlying condition, or it can be that your patient is just nervous to be examined. That is why it is important to get a good understanding of how your patient behaves under normal circumstances. However even for the untrained ear here are some pointers to look out or. If you hear a sound that is more like “lub…shhhh…dub”, that might point to a heart murmur. A heart murmur is caused when blood rushes too quickly through the valves. If you hear one there is still not immediately cause for concern as most people do have benign heart murmurs from time to time. However you should advise your patient to go check it out if you do detect one. If you hear another sound, other than the familiar “lub-dub” then your patient might have a ventricular defect. This third heart sound is referred to as S3 or a ventricular gallop. It sounds like a low-frequency vibration. Advise your patient to go see a doctor if you hear this third heart sound. Here is a list of normal and abnormal sounds that you can use to practice yourself. Go through this list and maybe after a while you can blindly identify some of the common heart conditions just by sound alone! The word “bruit” comes from the French word “bruit” and means “noise”. Usually when you detect a heart murmur in your patient you might want to check out if there are any bruit-sounds. They sound similar but are checked in completely different places. First you need to place your stethoscope using the diaphragm side over one of the carotid arteries. The carotid arteries are 2 big arteries that run in the front of your neck, on either side of the Adam’s apple. Be careful not to press too hard on the artery as you could cut off blood supply to the brain and cause your patient to faint. Never block off both arteries either as this surely will result in fainting. This is what MMA’s famous “choke-hold” is based on. A bruit makes a whooshing sound that indicates an artery is narrowed. Here’s usually where the confusion happens. A bruit and a heart murmur can sound almost identical. However a bruit will sound much louder when you listen to the carotid arteries rather than the heart. You can also listen for bruits over the abdominal aorta, renal arteries, iliac arteries and femoral arteries. A constricted artery is a serious medical issue and requires medical attention. Tell your patient to go see a doctor straight away! Ask your patient to sit up straight and breathe normally. If you cannot hear any breathing sounds or if the breathing is too shallow to hear any abnormalities then ask your patient to breathe deeper. Just like when doing a heart auscultation you need to use your diaphragm when checking the patient’s lungs. Listen to your patient’s upper and lower lobes and inspect the front and back. The aim of the game is to compare both sides of your patient’s lungs and note if anything sounds out of the ordinary. Normal breathing sounds are clear and crisp. It sounds like someone would be blowing air into a cup. Here’s a sample of normal lung sounds to train your ears. You can use these sounds to compare them to the ones you hear in your patients. Stridor-sounds sound similar to wheezing but occur when the patient inhales. This is usually the result of a blockage in the back of the throat. Also this can be heard at times without the need for a stethoscope. Rhonchi sounds sound like snoring. You need a stethoscope to detect these sounds. They are caused when air flows through a “rough” patch in the lungs or because the air-pathway in the lungs is blocked. Rales sounds sound like popping bubble-wrap or rattling in the lungs. This is heard when a person inhales. Divide the abdomen into 4 sections using your patient’s bellybutton as a reference. Listen to the upper left, -right and lower left, -right sections of the abdomen. Use the diaphragm side of the chestpiece of your stethoscope. Normal bowel sounds sound like when your stomach growls or grumbles. Anything else may suggest something is wrong and the patient requires further attention. You should hear growling in all four sections. However if your patient has just had surgery it might take a while for the growling sounds to return. Lack of bowel sounds. This should raise your suspicion. If you do not hear anything it might be that something is blocked in the patient’s stomach. It could also be indicative of constipation and bowel sounds may return on their own. However if they don’t then the patient needs to be checked out by a doctor. Hyperactive or fast bowel sounds can be indicative of Crohn’s disease, a gastrointestinal bleed, food allergies and a whole other host of not so nice causes. Have your patient checked out straight away. If these fast bowel sounds are followed by a lack of bowel sounds then it could be there has been a rupture or necrosis of the bowel tissue. Lastly very high-pitched bowel sounds can indicate there is an obstruction in the bowels. Air passing through the gaps of this obstruction is restricted, causing the high-pitched sounds. Turn up your volume to get the most out of this following video! This is probably where you and I have seen a stethoscope used most. You’ll need a “Sphygmomanometer” for this. In simple terms this just means blood-pressure gauge. On our right hand side we can see one. In order to measure your patient’s blood pressure you first need to roll up the sleeve if it’s in the way. If you measure someone’s blood pressure you always need to make sure the blood pressure cuff fits snugly on bare skin. Press the bell of the stethoscope over the brachial artery just below the cuff’s edge. You can also use the diaphragm if you have trouble hearing with the bell. The sounds to look out for are called “Korotkoff”-sounds. These are low tone knocking sounds that indicate the patient’s systolic blood pressure. Next inflate the cuff to 180mmHg or 30mm above your expected systolic blood pressure. You can find the reading by looking at the sphygmomanometer. That’s just a fancy word for the gauge on the blood pressure cuff. Then, release air from the cuff at a moderate rate (3mm/sec). As you release the air, listen with the stethoscope and keep your eyes on the sphygmomanometer (gauge on the blood pressure cuff). You should hear a knocking sound as air releases fro the cuff. Make a mental note the first time you hear such a knocking sound of the reading on your gauge. This will be the patient’s systolic blood pressure. Keep watching the gauge though as the second knocking sound will come just around the corner. After this knocking sound stops, note the number on your gauge when you last heard a knocking sound. This is the patient’s diastolic pressure. Lastly release all the air from the cuff once you noted these two numbers and send your patient home. If the systolic pressure is over 120 or diastolic pressure is more than 80, you might want to recheck your patient’s blood pressure once a few minutes have passed. If the second measurement shows again an increased blood pressure it’s time to go see a doctor to find out the cause!